You and I, Horizontal (II) is the first solo museum presentation in the Midwest by British-born, New York-based artist Anthony McCall. A key figure in avant-garde cinema and contemporary art since the 1970s, McCall has come to focus in recent years on the digital potential of the moving image, particularly in relation to sculpture. In CAM’s exhibition, McCall’s digital animation presents a slowly shifting beam of “solid light” whose physical properties become outlined within the haze-filled space of the gallery and are further enhanced through viewer interaction. Exploring light across space and time, this immersive presentation complements CAM’s concurrent exhibition Place is the Space through the encounter between projection and architecture. 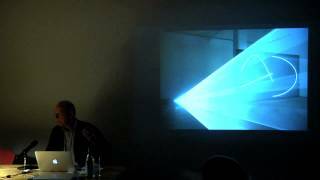 Anthony McCall (b. 1946, St. Paul’s Cray, United Kingdom) lives and works in New York City. Recent solo exhibitions include Solid-Light Works, Les Abattoirs, Toulouse, France (2013); Five Minutes of Pure Sculpture, Hamburger Bahnhof, Berlin (2012); Nu/Now: Anthony McCall, Moderna Museet, Stockholm (2009); and Long Film for Four Projectors, Tate Britain, London (2004). His work has been featured in numerous group exhibitions such as Light Show, Hayward Gallery, London (2013); Ends of the Earth: Land Art to 1974, Museum of Contemporary Art, Los Angeles, and Haus der Kunst, Munich (2012); The Cinema Effect: Illusion, Reality and the Projected Image, Hirshhorn Museum, Washington, D.C. (2008), Singapore Biennial, 2008; Beyond Cinema: the Art of Projection at Hamburger Bahnhof, Berlin (2006–7); and the 2004 Whitney Biennial and Into the Light: the Projected Image in American Art 1964–77, both at the Whitney Museum of American Art, New York (2004; 2001–02). McCall’s work is represented in numerous collections, including Tate, London; Museum of Modern Art, New York; Museum für Moderne Kunst, Frankfurt; San Francisco Museum of Modern Art; Centre Georges Pompidou, Paris; and Moderna Museet, Stockholm; among many others. Anthony McCall: You and I, Horizontal (II) is organized for the Contemporary Art Museum St. Louis by Kelly Shindler, Associate Curator.